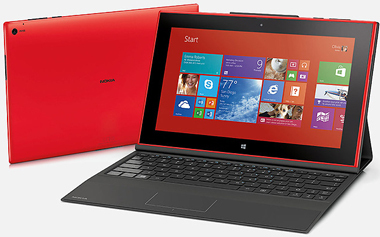 Nokia on Tuesday launched its first Windows RT-based tablet, the 10-inch Lumia 2520. Rumors of a Windows RT-based tablet from Nokia surfaced over the summer but fell under the radar in September, when Microsoft announced it plans to acquire Nokia's mobile handset business for $7.2 billion. Nokia's tablet unveiling occurred the same day as Apple's launch of its latest iPad devices -- the new iPad Air, a thinner and lighter version of its full-sized tablets, and a new iPad Mini with Apple's Retina display. The Nokia launch also came on the day that Microsoft began shipping its new Surface Pro 2 and Surface 2 tablets. Nokia's Lumia 2520 will ship this quarter with support for 4G LTE connectivity, unlike Microsoft's Surface tablets. It also comes with a 6.7 megapixel camera and Zeiss lenses. Besides the Surface, the Lumia 2520 is one of the only other tablets bundled with Windows RT 8.1. That will likely result in a poor reception, said independent analyst Jack Gold in a research note Wednesday. "Windows RT is not popular and is not selling well, for good reason," Gold noted. "It is a 'dumbed down' version of Windows which does not run all the apps Windows users expect. Most users have not been thrilled with the user experience. I don't expect Nokia to do well with this product for that very reason." Gold nonetheless described Nokia's new tablet as sporting an impressive design and expects it to appeal to those who want 4G LTE built in. 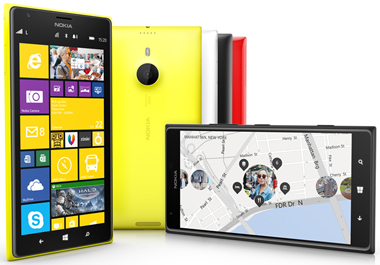 Nokia also unveiled two new 6-inch smartphones: the Lumia 1520 and Lumia 1320. Both devices run Windows Phone 8 Update 3, which begins rolling out to current Windows Phone 8 users this month. Among other features, Windows Phone 8 Update 3 supports larger devices, with screens between 5 and 6 inches. The higher-end Lumia 1520 features a HD 1080p display, the largest of any Windows Phone device, according to Microsoft's Michael Stroh on the Windows Phone blog. "This puts Nokia's new phone squarely in the 'phablet' camp, as some like to call the emerging breed of supersized, tablet-like smartphones," he said. It also includes a 20-megapixel PureView camera and four built-in microphones, and runs on a Qualcomm Snapdragon 800 quad-core processor. The device is expected to become available in multiple regions, including the United States, by year's end, with an estimated retail price of $749. The lower-end Lumia 1320 is expected to retail for $339. Microsoft says it will become generally available in early 2014 starting with China and Vietnam, and later to other Asian markets, India and Europe. 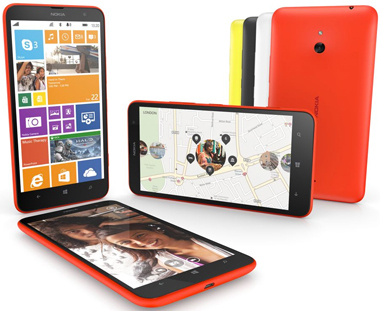 The Lumia 1320 comes with 8 GB of internal storage, but it can be expanded to 64 GB. It runs on a dual-core processor and features a 5-megapixel camera and a 720p display. For older Windows Phone 8 Lumia phones, Nokia is planning to roll out a platform update early next year called "Lumia Black." That update will deliver many of the features found in the Lumia 1520 and Lumia 1320 to older devices. Microsoft is also rumored to be readying the Windows Phone 8.1 software update for a 2014 roll-out.